Investing in property can deliver a return of up to 8.5 per cent - but only for those landlords who opt to buy in one of the UK’s buy-to-let hotspots. New research by national estate agents Leaders has identified the top 10 towns in which buy-to-let properties generate the greatest return on investment. The company analysed purchase prices, rental returns and expected gross yields for two-bedroom flats in the towns across the UK in which it operates its 123 branches. Allison Thompson, managing director at Leaders, says: “It’s clear the buy-to-let market continues to offer a return that significantly outweighs other investment types, such as stocks and shares. With good links to London and beautiful surroundings, Bury St Edmunds is in high demand among local tenants and those looking to relocate to East Anglia, making it a shrewd investment hotspot. Buy-to-let returns in Brighton increased by 13 per cent in 2014, making it the UK’s fastest-growing property investment market. Similarly impressive gains have followed in 2015 and 2016 to date. Historic Southsea is home to a booming property market in which rents have risen considerably in recent years. With an average two-bedroom flat still under £200,000, it is a shrewd place to invest. It’s not only great yields that are on offer in Cheltenham. The spa town is packed with quality properties, allowing landlords to benefit from both capital growth and low maintenance costs. Demand has outweighed supply in Leamington Spa for many years, consistently pushing up rental prices. The town is renowned in the buy-to-let sector for the wide range of properties it offers. Waterlooville is one of the south coast’s most affordable investment hotspots. A prime location and good value for money attract tenants and guarantee a great yield for investors. Nottingham boasts the cheapest property prices of any city in the top 10. As such, it is understandably a hit with investors looking to make a great return on a relatively small outlay. The north-west is an extremely attractive market for landlords who prioritise yields. A study by Lendinvest earlier this year named Manchester as the number one spot in the country for yields and current statistics show it is still performing strongly. In 2015, Milton Keynes was the fastest-growing urban area in Europe. This has resulted in a surge in demand for housing, driving up rental prices and making the city a must for ambitious investors. 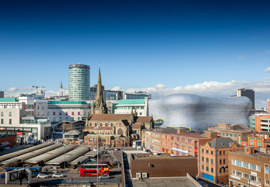 The UK’s second largest city, benefiting from excellent road and rail links, still offers relatively low property prices, despite a boom in demand in recent years. This has created an opportunity for investors to enjoy the largest returns in the country. Allison adds: “There are some excellent returns on offer for buy-to-let investors in a range of locations, but it’s important to bear in mind that demand, prices and rental yields can differ dramatically within a town or city, depending on the exact location and property type. To find a buy-to-let property offering a great return, visit Property Investment Hub.